I sometimes double upon on this recipe so I can have them the next day over steak. The carb count that Meal Planner Pro gives is not the net carb count. Be sure to use the net carb count I give in the serving size section. Heat butter or oil over medium-high heat until hot. Add onions and a small pinch of pepper. Cook for 5 minutes, stirring occasionally. Add mushrooms and a small pinch of pepper. Continue cooking without stirring for two minutes. Add vinegar, stir and continue sautéing until vegetables are browned and the vinegar has caramelized, about four to five minutes. Season to taste with salt and pepper. Don’t add salt while cooking or the vegetables won’t caramelize, they’ll steam as the salt releases their juices. Pile veggies on top of the steak. Make Ahead: Make extra onions to use in sandwiches, or on top of a burger, a green salad ... Remove the extra onions before adding the mushrooms. 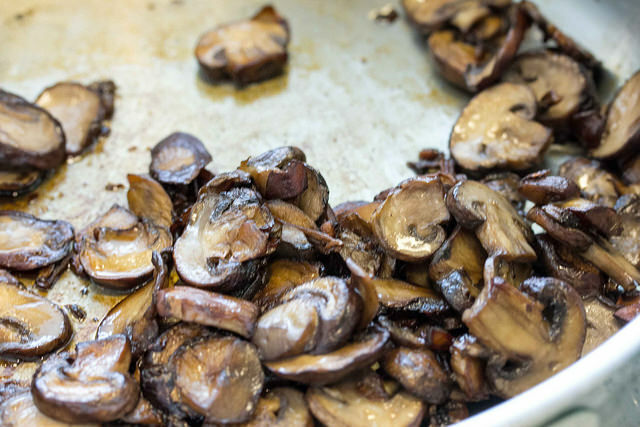 Or, just go ahead and double up on the entire recipe as Balsamic Mushrooms are great on sandwiches, burgers, and salads.